Here are a couple of portraits in progress. The one in the left of the photo is about 7ft. wide and will be a interior with seven people in it. It is a commission family portrait. 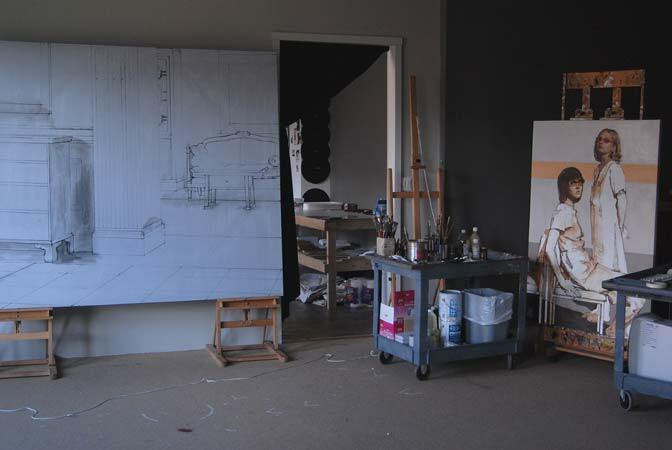 I’ve simply sketched in the interior at this point using the string on the floor which is attached to a vanishing point on the easel to the right of the canvas. I will complete the interior then add the figures in later. The painting on the right is a non-commission portrait of my assistants that will be in the US Artists show in Philadelphia, in October. trés bonne ambiance d ‘atelier.j’adore ta peinture….énormément! By studying your “First Fruits” I believe I know the personality of Joseph. No portait of him or narrative has given me this feeling or such information. I really believe I now know him. A wonderful work.